Kohls, C. (2013). Muster und digitale Werkzeuge für kreatives Denken im Hochschulstudium. In G. Reinmann, M. Ebner & S. Schön, S. (Hrsg. ), Hochschuldidaktik im Zeichen von Heterogenität und Vielfalt. Doppelfestschrift für Peter Baumgartner und Rolf Schulmeister. Norderstedt: Books on Demand. Berk, I. van den, Kohls, C. (in Druck). Muster, wohin man schaut! Zwei Ansätze zur Beschreibung von Mustern im Vergleich. Akzeptiert für die Proceedings der Jahrestagung der Gesellschaft für Medien in der Wissenschaft 2013. Kohls, C. (2012). Patterns for Creative Thinking. PLoP 2012 – 19th Pattern Languages of Programs conference. Tuscon, Arizona. Kohls, C. (2012). The Path to Patterns. EuroPLoP 2012. – 17th European Conference on Pattern Languages of Programs. Irsee, Bavaria. Kohls, C. (2011). The Structure of Patterns – Part II: Qualities. PLoP 2011 – 18th Pattern Languages of Programs conference. Portland, Oregon. Kohls, C. (2011). Best practices for designing interactive whiteboard content. Proceedings of Online Educa 2011. Berlin. Kohls, C. (2010). A pattern collection for interactive information graphics. In M. Weiss, & P. Avgeriou (Eds. ), EuroPLoP 2010. Proceedings of the 15th European Conference on Pattern Languages of Programs. Kohls, C. (2010). The Structure of Patterns. PLoP 2010 – 17th Pattern Languages of Programs conference. Writers’ Workshop version. Reno, Nevada. Kohls, C. (2010). Spielerisch lernen mit der interaktiven Tafel. Praxis Schule 5-10. Sonderheft Computainment. S. 55-60. Kohls, C. (2010). Keine Angst vor der Technik. 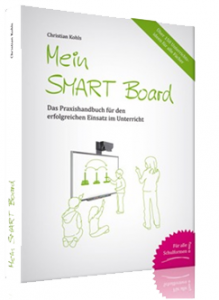 In C. Musekamp & D. Staemmler (Eds. ), Webinare für Einsteiger. Hamburg: Infoport. Kohls, C. (2010). Best Practices for the Use of Interactive Whiteboards in the Classroom – A pattern approach. Proceedings of Online Educa 2010. Berlin. Kohls, C. (2009). A Pattern Language for Online Trainings. In A. Kelly, & M. Weiss (Eds. ), EuroPLoP 2009. Proceedings of the 14th European Conference on Pattern Languages of Programs. Kohls, C. (2009). E-Learning Patterns – Nutzen und Hürden des Entwurfsmuster-Ansatzes. In N. Apostulopoulos, H. Hoffmann, V. Mansmann, & A. Schwill (Eds. ), E-Learning 2009. Lernen im digitalen Zeitalter (pp. 61-72). Münster: Waxmann. Kohls, C., & Panke, S. (2009). Is that true? Thoughts on the epistemology of patterns. Proceedings of the 16th Conference on Pattern Languages of Programs. Chicago: ACM. Kohls, C., & Uttecht, J. G. (2009). Lessons learnt in mining and writing design patterns for educational interactive graphics. Computers in Human Behavior. 25 (5). 1040-1055. Wedekind, J., & Kohls, C. (2009). Programmieren mit dem XO-Laptop. LOG IN, 156, 24-37. Kohls, C., & Scheiter, K. (2008). 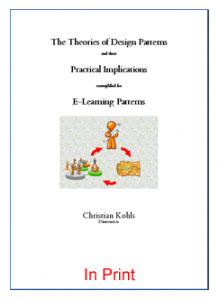 The relation between design patterns and schema theory. Proceedings of the 2008 conference on Pattern Languages of Programs (PLoP). Nashville, Tennessee: ACM. Kohls, C., & Haug, S. (2008). Gemeinsam sind wir stark! – Kooperativer Wissenserwerb mit Wiki. LOG IN, 152, 22-28. Haug, S., & Kohls, C. (2008). Syndication of e-learning content. In M. B. Nunes, P. Isaías, & D. Ifentaler (Eds. ), Proceedings of the IADIS International Conference WWW/Internet (pp. 423-425). Freiburg: IADIS Press. Kohls, C., & Windbrake, T. (2008). Moving objects – More patterns for a pattern language of interactive information graphics. In L. Hvatun, & T. Schümmer (Eds. ), Proceedings of the 12th European Conference on Pattern Languages of Programs, 2007: EuroPLoP ’07 (pp. 321-343). Konstanz: Universitätsverlag Konstanz. Kohls, C., & Windbrake, T. (2007). Where to go and what to show: more patterns for a pattern language of interactive information graphics. Proceedings of the 2007 conference on Pattern languages of programs. Champaign-Urbana, IL: ACM. Kohls, C., & Windbrake, T. (2007). Entwurfsmuster für interaktive Grafiken. In M. Merkt, K. Mayrberger, R. Schulmeister, A. Sommer, & I. van den Berk (Eds. ), Studieren neu erfinden – Hochschule neu denken. Reihe Medien in der Wissenschaft (p. 412). München: Waxmann. Panke, S., Kohls, C., & Gaiser, B. (2006). Participatory Development Strategies for Open Source Content Management Systems. Innovate 3 (2). Panke, S., Studer, P., & Kohls, C. (2006). Use & Usability: Portalevaluation mit Eye-Tracking und Logfile-Daten. In M. Mühlhäuser, G. Rößling, & R. Steinmetz (Eds. ), Proceedings DELFI 2006. 4te Deutsche e-Learning Fachtagung Informatik (pp. 267-278). Bonn: Gesellschaft für Informatik. Kohls, C., & Windbrake, T. (2006). Towards a Pattern Language for Interactive Information Graphics. Proceedings of the 2006 conference on Pattern languages of programs. Portland, Oregon: ACM. Panke, S., & Kohls, C. (2005). Collaborative development strategies for Open Source. Involving the user’s perspective. In F. de Vries, G. Attwell, R. Elferink & A. Tödt (Eds. ), Open Source for Education in Europe, Research and Practice (pp. 107-116). Heerlen, NL: Open University of the Netherlands. Kohls, C. & Windbrake, T. (2003). eLearning Development Environment jtap. Proceedings zur ICSEI 2003. Sydney, Australien. Kaiser, S., Kohls, C., Windbrake, T. (2002). Javanti – Using Tcl to design interactive eLearning materials. 9th Annual Tcl/Tk Conference. Vancouver. Kohls, C. & Windbrake, T. (2002). 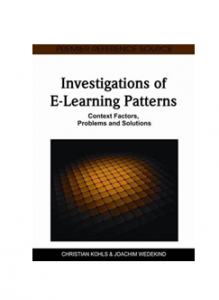 eLearning Development Environment JTAP – New Approaches to eLearning Content Creation. European Distance Education Network (EDEN), 2nd Research Workshop. Hildesheim.